. . . After convincing his grandmother to join him on The Amazing Animal Race, Armando uses scribbled addresses from his mother’s journal to locate the fascinating people who’d known her. Through them he gains insights into her vibrant character. He also uses her detailed notes to find and photograph the endangered race animals. Just when Armando is set to win the race, a spectacled cobra bites him in India. All seems lost when his father tracks him down to bring him home. Armando must then make a crucial decision: stand up to his father and continue the race or say nothing and forfeit his mission. The choice Armando makes transforms not only himself, but his whole family. 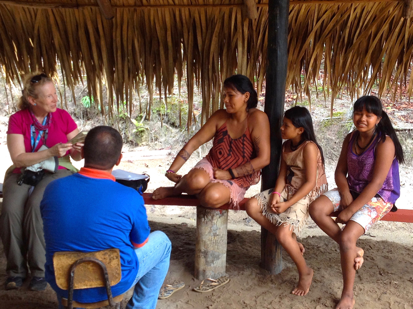 Diana researching book with Amazon Indians and Nat Geo guide in Brazil.